Used for thousands of years in India and still to this day widely used in Ayurvedic medicine. 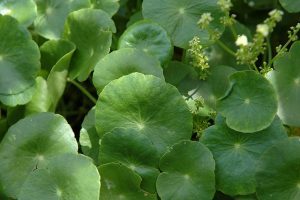 Has a longstanding reputation as a mental “rejuvenator”, helping concentration and memory especially in the elderly. Active Constituents: Triterpenoid saponins (asiaticocide, bramoside, thankuniside), alkaloids (hydrocotyline), bitter principles (vellarin). Toxic in large doses and not to be used if suffering hypertension, with cardiovascular disorders or peptic ulcers. Avoid during internal bleeding as it may restart haemorrhage. Taken in excessive doses can cause hyperglycemia. May be a reduction in female fertility.